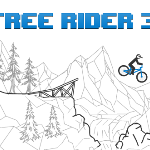 A free style biking game where you have the power to create your very own biking levels from scratch. Show that little bean who is boss and fling him as far as he'll go. Use power ups to make him go even farther. Snowboard your way through 3 kickers by jumping and performing various combos and stunts to get the most points.